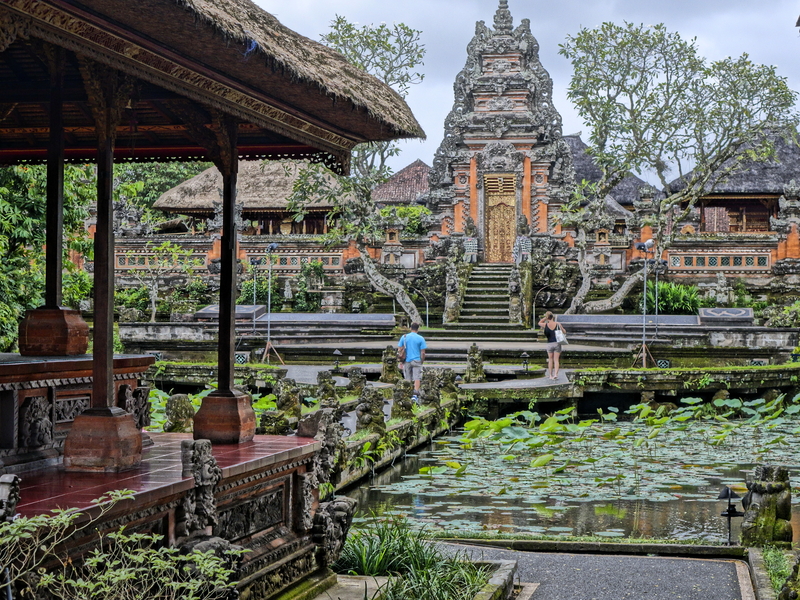 One afternoon during the 2012 monsoon season in Bali, I wandered out of the rain and into KAFE, a restaurant on Jalan Hanoman in the mountain village of Ubud. KAFE is a lively and exotic place where locals as well as travelers—from minimalist backpackers to five-star tourists—tend to mingle. The food is wholesome and healthy, and you can drink the water and eat a salad without fear. Kafe oozes with atmosphere: a tropical café spiced with a dash of California bistro. Designed for hanging out and ecological rapport, all the furniture is made by hand from recycled wood. KAFE is a two-story affair with tables upstairs, some on the balcony overlooking the street below and temples in the distance. Downstairs, there’s an outdoor sidewalk area (for those who believe if there is no law against smoking in a restaurant, light up) and inside, an area designed for lounging: a raised platform with over-stuffed pillows on which to sit and lean against and a table two-feet, or so, high. This is what we talk about when we talk about serendipity: I usually like to sit at a regular table in KAFE, as it’s easier to read or use a laptop than lounging half prone. But that day, the only table available was one in the lounging area. I found myself reclining next to a couple of travel-weary-looking vagabonds, Alison and Don. They were not a 20-something couple, Don was maybe in his sixties. They’d just spent a month in an ashram in India, searching the spiritual realms of life. They were both thin, slightly gaunt, and perhaps sitting a little on the hallelujah-but-thank-god-that’s-over side of things. They had both shaved their heads. Turns out they had sold their house and all their belongings and were off to travel the world, and write about it. Alison had her computer with her and was working on a blog post as she sipped her hot ginger tea (or whatever she was drinking?). Don and I got to talking. This is where the serendipity begins: they were staying at a place nearby called Kunang Kunang. Kunang kunang means “fireflies” in Bahasa Indonesian. I was living in a place on the other side of the Sungai River, and it too was named Kunang Kunang. Serendipity refers to the occurrence and development of events by chance in a beneficial way—something lucky happens for no apparent reason. The name of our accommodations was not serendipity, but something closer to mere coincidence, yet, perhaps the starting point for something. My mother used to say: your middle name is “was gonna.” I have good intentions, I am capable, I can do what I need to do, but following through on plans or projects or promises is not something I do well. “Sustaining discipline” is one of those things my mind simply does not wrap itself around with ease and finesse. I had been meaning to start a blog for quite some time. I resisted writing a blog years ago because I wanted to publish a book, I wanted someone else, a publisher, to like my book, think it was good enough to publish, and pay me for it. And at that time, the web was new, blogs were new, and they seemed—I don’t know—perhaps, somehow immature to me. But, as with most things, things change. Way before monsoon season 2012, I had changed my mind about writing a blog, and had decided to create one. But I wanted it to look right, and have the stuff on it I needed. However, I didn’t know a thing about themes, and I didn’t know even what “stuff” was available or what stuff would be desirable for my particular blog—what tabs, what info. One thing I knew was that I didn’t want a theme with a photograph at the top, I wanted one where the title was separate from the rest of the blog, and seemed like a title. I don’t know why I wanted that because I’m an avid photographer, so it’s not that I don’t want photos in my blog, photos are a major part of my blog, perhaps the most important part (my blog is now 10 days old, so I still don’t know exactly what it’s going to look like or become…I’m just following the Blogging 101 course, and trying to find my way around WordPress and the blogosphere (a new vocabulary word for me, along with widget and SEO), and this is assignment 9: write a post that builds on one of the comments I left yesterday on someone else’s blog. I looked for months (not that hard, not that long). Remember, scant discipline. So I’m in Ubud again by chance (10 days ago), and the Blogging 101 course is going to begin tomorrow. I’m sitting at a regular table in KAFE and going through the steps to create my blog. And I’m a little miffed at myself—OK, very miffed—for not having spent more time finding a fitting theme. In my mind, it was the most important point. Someone had told me at some point—I think it was Alison and Don—that you could change your theme later, but I thought: whoa, I’m not going to spend all that time setting up my blog on one theme and then spend all that time again setting it up on another theme later. Better to just do it right the first time. I had spent months thinking of names for the blog. I had narrowed it down to two names. I thought the proper theme and the right name were equally important. And I hadn’t decided on either. So imagine me really miffed while sitting in KAFE as I go through the beginning steps of creating my blog. Serendipity: My blog name falls in my lap. It is neither of the two names that I thought it would be, both of which I had loved. I will leave the story of how my blog name found me to tell another time—but it evolves around my sister Donelle’s son Rob who died of cancer a few years ago. My blog name is nothing like I dreamed it would be—having something to do with travel, or gypsies, nomads, or vagabonds. Nothing like any of the other names I’d thought of. Not even close to something like Nomad Panda. Or Gypsy Whims. Or Vagabond Heart. I had wanted my blog name to have something to do with vagabonding and travel. However, you ever see a car you like and know that’s the next one you’ll buy? You ever see a person and know that’s the one? I doubt too many people would imagine Badfish would do something like for them. It’s not even Badfish Nomad, nor Badfish Travels. Back to creating the dang blog: this kills me every time I think of it, now. I get to the part where you choose your theme, and the directions say something like: don’t waste your time worrying about a theme, you can change it later with ONE CLICK, no problem, no worries, dingbat. I’m paraphrasing here. After all the delaying because of not deciding on a name or a theme, after months of worrying and reems of notes, then this: to begin your blog, those two things, name and theme, are perhaps the least important because, by god, you can change them easier than catching fireflies in a jar, which locals wouldn’t think of doing in Bali. The Balinese do possess this uncanny penchant and uncontrollable desire to fly kites, though. Huge kites. Some, two times as tall as a grown man that thrum in the wind and sound like some angry creature hovering overhead. The first time you hear one, in a country where nothing is exactly like where you come from, you might step to one side of the path running through a rice paddy, lean behind a coconut palm, and wonder jwtf is coming your way. Serendipity. For the last two years, I’ve been following Alison and Don’s adventures, which always have an ethereal, spiritual feel—some funny, some not fun at all, but isn’t that the definition of the word travel? Aren’t there two sides to everything? For two years, I’ve been “thinking” about writing that blog. I “was gonna” do it. I was gonna think of a name. I was gonna find a theme. I was gonna study up on how to do it. I was gonna reread all the info I’d gathered. Was. Gonna. Did. Not. So you can see why I’m feeling a little miffed sitting in KAFE and trying to start this process the day before the Blogging 101 course starts. Miffed, but I have to say, also excited—sometimes, things change a lot. Take this post: it’s supposed to “build” on one of the comments from yesterday. I made a comment on Alison and Don’s blog, but this post is building its own road and isn’t what I intended to write at all! When I wrote my family that I’d started a blog, my sister Donelle, said: “You’ve always been a blogger. There just wasn’t any such thing as a blog before.” And she’s right. I left home at 17 and traveled as much as I could. I would write letters home from every place I went. I would send postcards from the edge of everywhere. If they had a contest for who could write the smallest and get the most information on a postcard, I’d win hands down. Serendipity—the occurrence and development of events by chance in a beneficial way. I don’t think I would be writing this blog if it hadn’t been for that one chance meeting when I met Alison and Don in KAFE in Bali, and then following them on their nomadic, spiritual journey from India to Peru to Samoa. They have also helped me create my blog. I would like to call them my friends. But the truth is, I’ve only been “with” them for maybe an hour sitting in KAFE. We have corresponded a bit since then. I’ve followed their blog, so it seems to me that I know them; I guess I know them far better than they know me. They are the kind of people you’d like to invite over for dinner some time, the kind of people you’d follow into an ashram, the kind of people you’d follow on a blog, the kind of people you was gonna be. CHUFFED?? Is that an Ozzy word? Yeah, it was your perseveration at writing, and especially your photos included (! ), that moved me forward to “am doing.” Hey, while I have you here, we’re supposed to include a “pingback” in today’s assignment. All the info is, is to supply a “link.” How do I do that…just insert the url (like I did with yours…did you get a pingback from this post?) or what? In the visual version only the words Adventures in Wonderland will show and they will be underlined, and in the published version Adventures in Wonderland will be in a different colour and will link to our blog. I have put a space between rel and = so you can see the code. If you close this space all you will get is the words Adventures in Wonderland which will also be a link to our blog. As I said you can use this code to make a link to any URL and call it whatever you want. For instance in my next blog post I will have the words ‘the tree in Western Australia’ but I will put them in the space above where the words Adventures in Wonderland are. The URL will be a previous post I wrote about us climbing a tree that I want to refer back to. Hope this makes sense. what’s the code? Hey, remember that weird exchange during the Watergate fiasco? I’d love to have the code…I caould refer to such as “chicken thingy” and such. Hope it works this time and that you can see the code. then you type in the words you want, like chicken thingy. Well, I think this should work! OMG WordPress is just too clever by far! I give up! I can really identify with your post. I often said to Phil one day I AM GONNA write your story. At 17 he was a £10 Pom Hippie. And I am hoping blogging will show me the way. I am now following Alison and Dons blog… And left a message on a potential place to stay in NZ. Isn’t Bloggasphere Awsome! makes me wanna travel too! Cool! What’s a Pom Hippie? Good luck with Phil’s story…it seems to me that these blogs offer the kind of headspace and self-motivated discipline to actually do some writing at some point (once I’m through with this 101 learning curve stuff!!! And the Blogosphere…more awesome than I could have imagined. Badfish I love your blog…those photos in the rain have a sort of impressionist feel to them. I am a big fan of rain, but GOA seems to have even more than I could appreciate. Thanks much, Grad! Hey…what were you trying to do before with Alison…create a pingback? Did you figure it out? I was trying to give the code to hide URL’s behind words. I sent you both an email about it. Ahh…right. I do that a very easy way. While in create-a-post mode, you copy the url, highlight the word you want to hide it behind, click that little icon that looks like a link (next to the one that looks like a broken link) above your post, a box drops down, you paste url in the box. Voila! Done. I think this also creates a pingback to the site of the url. It will only create a pingback if it’s another WP site. Well…as of now, that works for me…as I have no blogs (I don’t think) outside WP, so it hasn’t been a problem. If I travel nowhere this summer, I “should” dedicate some time to delving into blog stuff…and LightRoom. And iPhone 6. And Sonly RX-10 manual. Sounds like work. Maybe I should just go back to Bali. Look up two comments. I do it an easy way. But Alison says it only works on WP sites…which is all I need so far. You could begin pinging easily there, branch out later with code? Personally, I don’t even want to know how to write code!! Yup, I’m resistant.